At London Fashion Week is where I came across the lovely Kelly Jackson and her brand Only Child London. 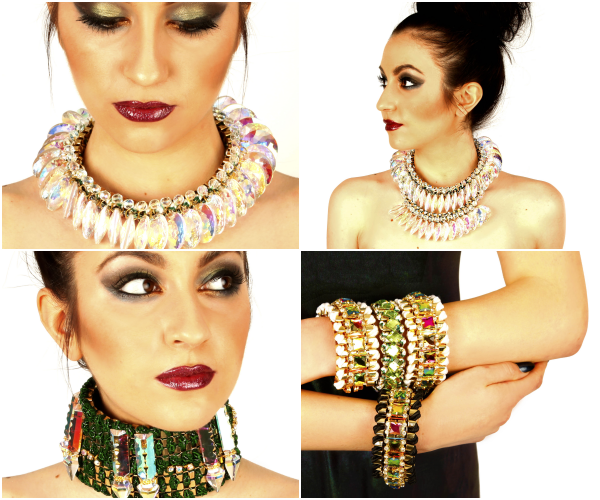 The jewellery collections are eye-catching pieces, either made up of amazing crystals or unique designs such as the popular, born with a silver spoon. Kelly herself gained experience working at Alexander McQueen and also has been featured in numerous top magazines with Only Child. If that wasn’t enough Only Child is loved by top celebs like Ellie Goulding, Rihanna and Miley Cyrus. Only Child is looking like the must-have jewellery brand of 2015! Can you tell us more how Only Child came about? How did you choose the name? I decided to start my own jewellery label after working for a number of fashion brands, mainly hand drawing textile print designs and being a freelance illustrator. When designing prints at Alexander McQueen in 2010 I sat in the accessories department for a few weeks and decided that was the direction I wanted to go in, I’ve always been mad about jewellery and worn a lot of it so it felt like an easy transition for me. After getting some jewellery making experience working with other jewellery designers, I began making my own pieces and ONLY CHILD was born! I’m an only child – I didn’t want to use my own name for the brand so it seemed like a good alternative…and it’s something that I get reminded of a lot! You have built up a fantastic celeb following including Ellie Goulding, Cara Delevingne and Rita Ora. Who would be your ultimate style icon to be wearing your pieces? There’s so many! I’ve been lucky enough to have such a great line up of celebrities wearing ONLY CHILD already, there’s the super famous obvious ones like Rihanna, Miley Cyrus, Lady Gaga etc. We’ve had Kylie Jenner and Solange Knowles request pieces in the past and they’re definitely two people who I’d love to see wearing it. I also really like FKA Twigs & Charlie XCX’s styles so they’d be a dream to have wearing OC. How did you find being at the LFW showrooms? Was this your first fashion week? The BFC Showrooms at LFW are really great, it was my second season showing there and there has been a lot of interest in the collections, we’ve gained a number of high-end stockists like Luisa Via Roma from being there which is fantastic as well as some great press exposure. 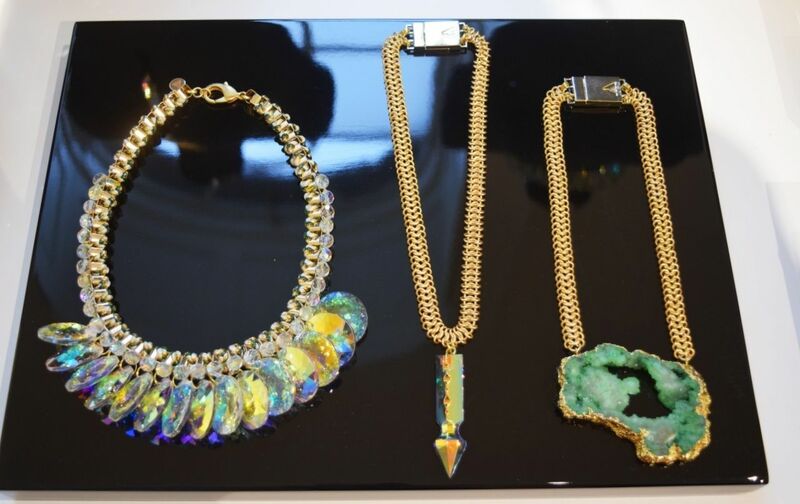 It was great to see the new AW15 collection at LFW, what caught my eye was all the amazing bejewelled pieces. Can you tell us a bit more behind the inspirations for it? I’m completely obsessed with unusual crystals – both natural and glass, I’ve worked with them right from the beginning. The statement pieces that have had a lot of attention like the Crystal Armour from the SS15 collection and the Frilled Dragon Crystal pieces from the AW15 are definitely the most creative show pieces I’ve designed so far. The inspiration behind the AW15 collection ‘The Reptilian Elite’ was the conspiracy theories surrounding the Illuminati, quite far-fetched ideas about royalty/heads of state being lizard people from another planet – it all sounds ridiculous from the outset but has really made my imagination tick. What’s your favourite bespoke piece you have made? 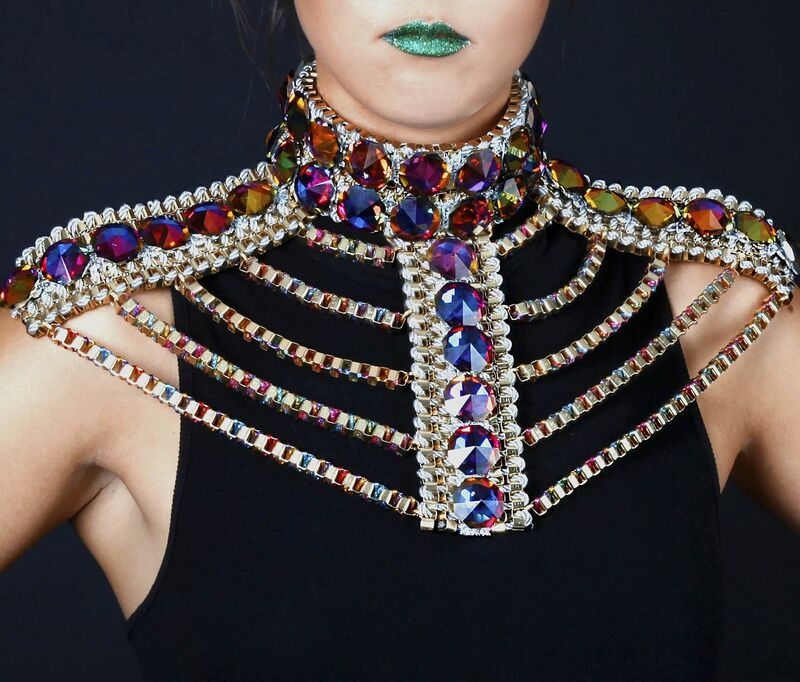 The Crystal Armour pieces (as they are all unique) are probably up there as well as the ‘Ice Crystal’ bespoke capsule collection I designed for a gallery in New York last year, there’s a crystal crown that is definitely one of my all time favourites. Aside from jewellery do you see Only Child branching out into other accessories like the jet pack backpack you have on the site? I would love to explore designing other accessories more, the Jetpack has gone down so well I think it make sense so maybe in the next year or two! The rooftop of my flat in Victoria Park Village. I eat a lot – Japanese food and probably American BBQ food is my favourite. Next up we’ve got a really big new stockist, in which I just designed an exclusive collection for being released in May/June and I’m hoping ONLY CHILD will show at Paris Fashion Week next season. I’m also opening a shop in Shoreditch in July called SHOWROOM SHOREDITCH – stocking both ONLY CHILD as well as 25 emerging independent designers which I’m really excited about! Thanks Kelly, I cannot wait to check out the showroom in the Summer and also to see the exciting collaboration coming up!